Fire and Emergency Medical Service Conspicuity Tape is an outdoor durable, chemical/scratch resistant reflective sheeting. Easy to apply, designed for vehicle graphics applications. Rated for use outdoors for a 7-year lifespan. Excellent choice for marking anything that requires a high level of nighttime visibility. Aggressive adhesive system will adhere to most any clean, dry surface. High intensity product has a reflective value of over 4 times that of the Reflective Tape. Intended for application on relatively flat surfaces only. Meets or exceeds ASTM D-4956-99 Type III. Fluorescent reflective tape offers the highest level of visibility. Aggressive adhesive backing with 10-year durability. Meets or exceeds ASTM D-4956 Type VIII. 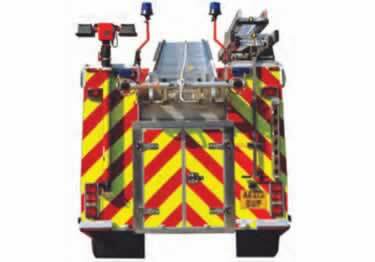 To provide increased visibility for fire trucks, ambulances and other emergency vehicles. Contains Prismatic technology which works by refracting light during day light as well as night. Reflective Tape for Fire and Emergency Medical Service, Conspicuity Tape comes in Red, White, Blue, Orange, Yellow, REd/White, Yellow/Black and Green is an outdoor durable, chemical and scratch resistant reflective tape . The Fire and Emergency vehicle Reflective Tape beat my expectations. It was easy to apply and the quality was very well made. Thank you for the product review and the kind words about our Emergency Vehicle Tape. We strive hard to only offer the highest quality products at a great value. I put this tape as a border on promo board beside the street and is good at night to attract attention. It is very reflective and once it is attached: IT IS ATTACHED!!! It contours to whatever it is put on and it STICKS! Black tape doesn't distract from whatever it is on, but it really reflects! Choose from tape & stickers. Provides the longest sight detection & withstands high-pressure washing. DOT&CCMTA Compliant.